The first thing to understand about the Navajo language is that it is spoken in an Affirmative thinking system within the natural order as described in the examples of time and cardinal direction correlated with blessing way principles moving clockwise. Typically, English is spoken symbolically in a triangle and in a different thinking system. It is in the context of hierarchy, patriarchy and describes everyone in their deficient self-image, which must be remediated into some end-state of civilization or enlightenment. English is abstract. It is a trade and commerce language. Navajo is descriptive and exact. Therefore, healing ceremonies are exact and actual in the natural order, which is not religion, philosophy or theory. 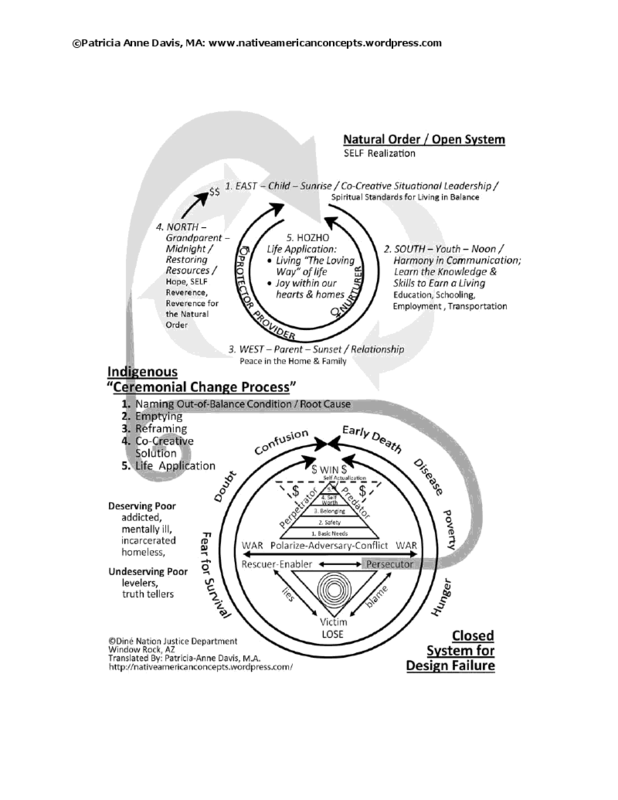 Below, you will find a graphic representation of the transcendence that occurs when the Closed System of Diseasethat is designed for failure is re-framed into the Open system of the Natural Order during the Ceremonial Change Process. There are four phases to every healing process that leads to curing, not coping. Before defining them, one must know that the healing process does not exist in the English language thinking system, but it can be described to convey the integrity of the sacred meaning of Navajo words. The term “Navajo” is an imposed name. We Dineh have several spiritual names that identify us to the creator as a precious child of divine creation, made of earth-physical, water-emotive, fire-mental and air-spiritual. Corn is the symbol of food as social medicine within the economic relationships of the clan system. Our spiritual names are inclusive and universal in application to all people. One name is “earth-surface people”, another is “five-fingered” people and another is the affirmation: “I am a precious child of creator”. When a person makes decisions that are destructive and death-producing, this is considered misuse of thinking by using thinking for what it is not for. All ceremonies correct erroneous thinking that “tell” the body wrong information. Every out-of-balance condition is a consequence of saying “yes” to destructive and death-producing choices and saying “no” to constructive and life-affirming choices. When a person denies the unifying principle that all creation is Inter-related, this is “stress”. All of the diseases are a consequence of denying our oneness with the creator’s will-to-love. All Navajo healing ceremonies restore a person to their true spiritual Self-identity as a precious child of creator made of the four sacred elements: air-spiritual; fire-mental; water-emotive; earth-physical body. When any one of these elements is out of balance, there is dis-ease with creator’s will-to-love that manifests as disease. The Navajo language is a spiritual language spoken with living words that manifest vibrations for affirming truth in the laws of nature or the natural order of time and direction from East-thinking, West-planning, South-decision making for collective survival and North-equity in restoring resources to the next generation moving clockwise within temporal time and cardinal direction. For example: sunrise, mid-day, sunset, mid-night; spring, summer, fall, winter; child, youth, adult, and elder. Also, white people, red people, yellow people and black people, all born equal in the sacred circle of life within the holiness and wholeness of hozho. There is no concept of separation from creator or from the natural order. There is only the principle of making constructive and life-affirming choices.